Our next trip was a few months after our first guests left. We had so much to do to get settled and feel like we were "done" moving, that we decided to put travel on hold until we we could really focus on it. We decided our first trip by ourselves would be to Venice Italy in July. :) It's just an hour flight from Munich to Venice, so we hopped on a plane and found ourselves in a hot, but exciting area not long later. We bought public transportation tickets that included trams, busses, and water taxis so we could hop on and off whatever we wanted at any time without having to worry about buying individual tickets. It made sense for us for this trip, and we often end up choosing this option on our trips, but make sure to do the math and confirm that you'll "use up" your cost (or decide that the convenience is worth spending a little more). We had pizza our first evening (with an egg cracked on top after baking!). 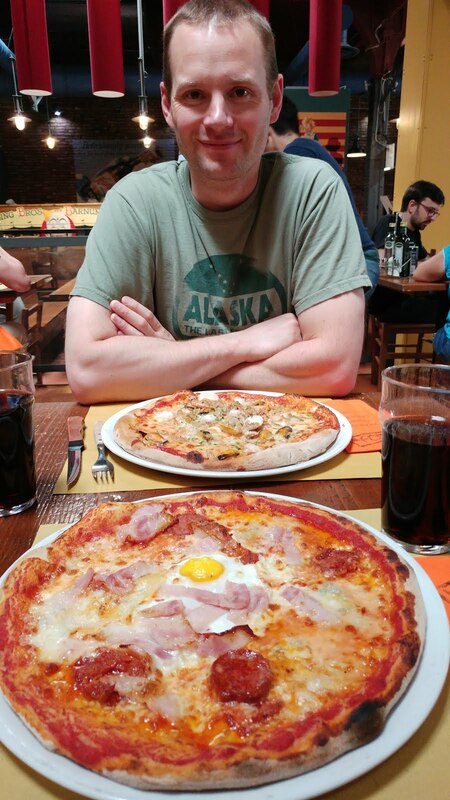 The pizza itself was really good though, and the egg mostly cooked on the hot pizza before we ate it. :) Tyler got a seafood pizza with clams (including shells!) and shrimp which was really good too. One really nice thing about travelling to "tourist" destinations is that almost everyone speaks enough English to get by. It's very easy to be an English-speaking tourist in Europe. Don't be afraid to go see new places! Our first full day in Venice, we took the vaporetto (water taxi) and listened to Rick Steves' audio tour of the Grand Canal. 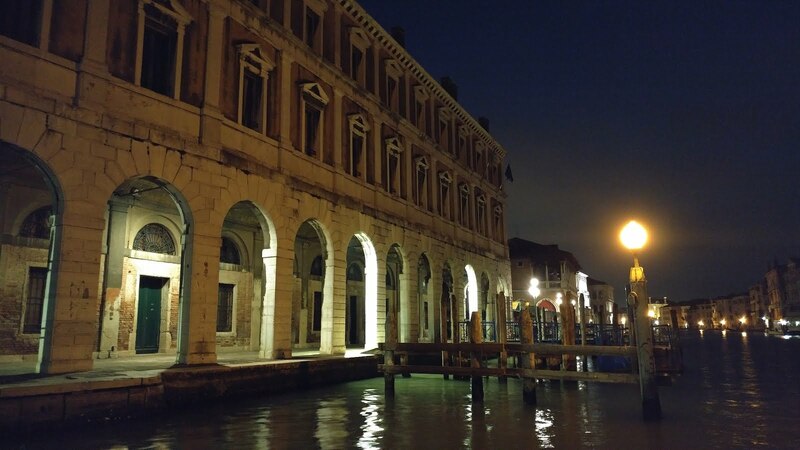 It was really fun to learn about the history of Venice. If you've never tried out Rick Steves' audio guides, I highly recommend them. You can download his app for free, and all the of the content is free also. 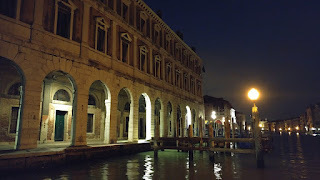 After finishing our audio tour, we stayed on the vaporetto and continued on to the island of Lido. We wanted to spend the afternoon at the beach and this was a great place to do it. It's a seven mile long stretch of beach, to be exact. 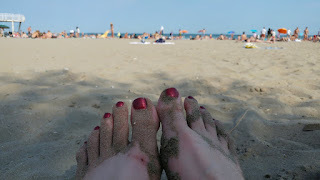 :) We enjoyed some sunbathing, and we did get in the water for a bit, but each of us ended up with several jellyfish stings, so we quickly retreated back to the shore. We found a great little restaurant on the beach for dinner...I still remember my spaghetti with clams! Delicious! On the way back to the vaporetto dock, we got some amazing gelato, and headed back over to Venice proper. 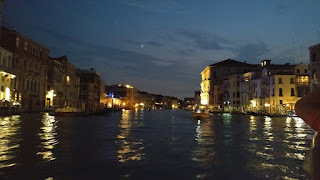 I would highly recommend going back through the Grand Canal at sunset, as the lights over the water give a whole new feel to the "cruise." We didn't listen to the guide on our way back, just enjoyed the sights and sounds. 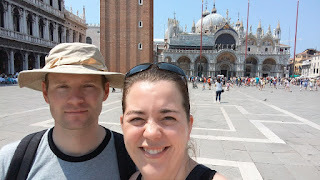 Our second day, we headed back into Venice, but this time, strolled the streets instead of taking the boat. It's seriously amazing that the locals can find their way around without a map. We took several wrong turns even with GPS! But around every corner, there is something new to discover, and you almost don't care that you're lost. :) Almost all of the "streets" in Venice are canals of water, so bridges are found everywhere (about 400 of them throughout the city!). It's a neat experience not having paved roads, and having to find access points to cross instead of jaywalking. We visited St. Mark's Cathedral and the famous square just in front, then did a quick walk-through of the Correr Museum. I'd say you can skip the Correr Museum (but I'm not a big fan of art). It was incredibly hot, and the Correr's Museum was air conditioned so that was a plus for it, but otherwise we were underwhelmed. :) We had some sandwiches from a bakery for lunch, and more gelato, but this one wasn't as good as the one from Lido. We spent the afternoon touring the Doge's Palace which I recommend. 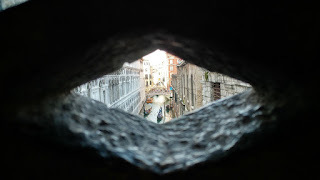 It was really cool to see the inside and walk across the inside the of the famous "Bridge of Sighs" which leads to the jail, right next door to the palace. For dinner, we splurged on a nicer restaurant. We didn't have reservations, but everybody eats really late in Italy (9pm or later) so if you go "early," you can often get a table as long as you're okay with wrapping up by 8:30 or so. I suppose you could also plan ahead and just make a reservation. ;) We had a really yummy monkfish appetizer and some good seafood main dishes. For dessert, we decided that the gelato was so good from our little gelateria on Lido that's we'd take the vaporetto back just to get another cup. :) So we hopped back on the boat for a 45 minute ride to grab some gelato and then took the vaporetto back to the tram station to head back to the hotel. That was a great way to wrap a really fun trip!